The new easy-to-use Prochem Stainless Steel Upholstery Tool with 1.8m (6ft) internal solution hose, vacuum hose and external O2 spray tip. Soft and hard surfaces for general use. Finishing treatment for cleaned leather upholstery, which replaces natural oils, restores suppleness and helps protect. Nourishes and lubricates with no greasy residue. Recommended for use after cleaning with Prochem Leather Cleaner. For professional and industrial use only. Shake well before using. Ready-to-use, do not dilute. Replaces natural oils, restores suppleness and helps protect. Contains natural oils and conditioning agents. Recommended for pigmented smooth leather. Pre-inspect leather condition for cracking, stains, cuts or damage. Pre-test in an inconspicuous location for colour fastness, darkening or texture change. May slightly darken light coloured leathers. Not recommended for suede leather. Avoid application onto wood or other surfaces. 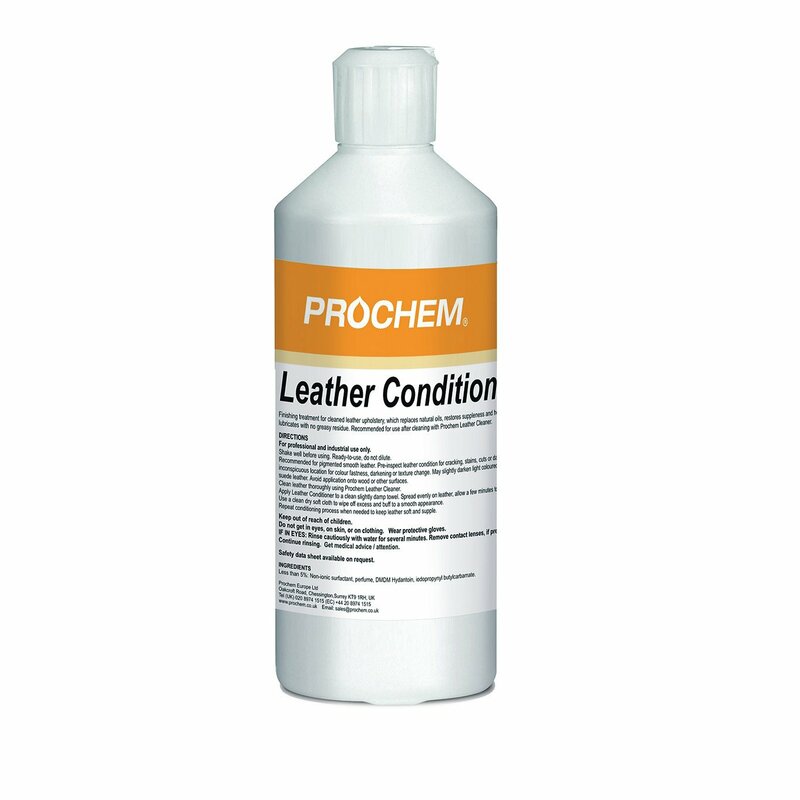 Clean leather thoroughly using Prochem Leather Cleaner. Apply Leather Conditioner to a clean slightly damp towel. Spread evenly on leather, allow a few minutes to absorb. Use a clean dry soft cloth to wipe off excess and buff to a smooth appearance. Repeat conditioning process when needed to keep leather soft and supple.